Imagine you woke up one morning inside a small room. The door was sealed tight, and through the windows you discovered this room was sitting all alone on the surface of Mars. You look around and see that there is enough stored food and water to survive for a long time, and the air scrubbers seem to be working well. Exploring the room you discover a manual which informs you that your needs will be supplied into the distant future. You will be expected to work inside that room for your life-sustaining supplies- but if you can't work (or just don't want to), you can apply to those who control the habitat to have your needs met anyway. Or, let's imagine you are sitting in a cage surrounded by ravenous carnivores. Some symbol of "freedom". Ironically, the eagle's name is "Liberty"
In either case, how free are you? How much liberty do you have? Sure, the Mars habitat and the cage might keep you alive, and death isn't really freedom in any meaningful sense. In your current situation you might be grateful for the protection, but is it sensible to love the cell, or honor those who put you into the position of needing its protection in the first place? And would you really spend time supporting whoever put you in that place and arguing in their favor? Is the protection fundamentally necessary, or was it made necessary, in order to survive your current situation, only by the evil actions of someone else? 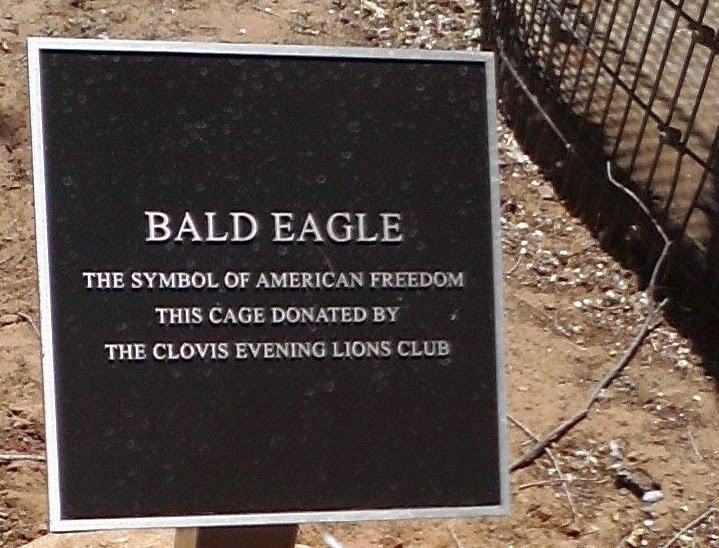 Would you celebrate your "freedom cage"? Or, might you accept that even though you'd otherwise be killed, you are still a prisoner? Well, why celebrate "borders" or The State and the Freedom Cage they have built around you? Do you really believe this is a good way to protect freedom? Much less, Liberty? The only reason you are in danger from "terrorists" or "immigrants" is because of the liberty-violating actions of those calling themselves "government". The existence of other, possibly distant, government gangs doesn't justify the existence of a closer government gang, nor does it show that "your" gang protects you from the other gangs. Gangs are gangs; none is really substantively "better" than others. Fear of the others shouldn't inspire loyalty to one which claims to protect you from them. Maybe I'm wrong. It has happened before. To me it seems you are just celebrating your Freedom Cage.